How do you feel about VR being removed from Kraken? Let us know in the comments below! To learn more about other roller coaster offerings at SeaWorld Orlando, visit SeaWorld.com/Orlando. there may have been other issues with maintenance, royalties, of health with the spread of germs wearing sanitized head sets. I think through put is also a big issue. It takes so long adjusting the headsets of each rider that queue times sky rocket and the number of riders per hour drops through the floor. 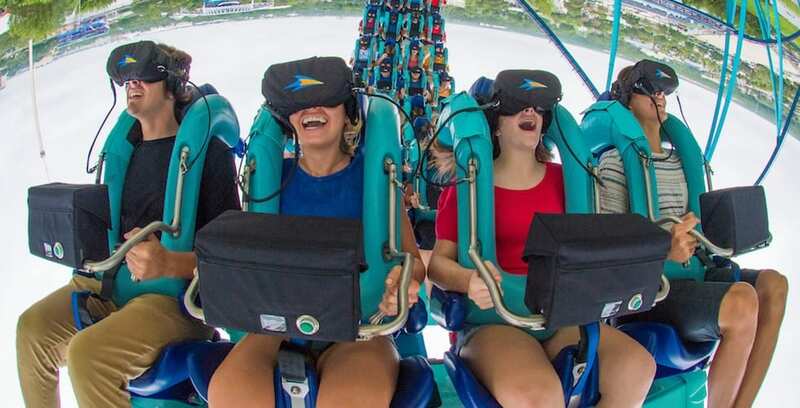 At least that’s been one of the biggest problems we’ve seen with VR Coasters in Europe. Was there last year when they were still working on it. Going again next March, was looking forward to trying it. So disappointing. I think they could at least give you the choice? Yeah, I’m glad it’s gone. The year they installed it, we just got passes and were bitterly disappointed that Kracken, being one of our favorite coasters was no longer an “easy ride”, having to make an appointment to ride it, etc. Also, it was no longer included on the Quick Queue passes. To us, it was like they removed a HUGE offering from a park with already so little thrills. We did the VR thing twice…my video froze the first time, making me sick, and both times…I had to hold the mask on my face with one hand to keep it from sliding down…in turn, not being able to hold on to the harness to keep my ears from getting boxed on some of the tight turns/loops. Wasn’t a fan. Kracken can hold it’s own as just a great coaster.